Smart Food Storage Made Simple The Always Fresh Container™ system is a handy new kitchen product at the forefront of the food storage frontier. These smart storage containers are made with a natural and environmentally friendly material that helps extend the lifespan of edibles by a bsorbing and removing food-spoiling ethylene gas released during the natural ripening process. 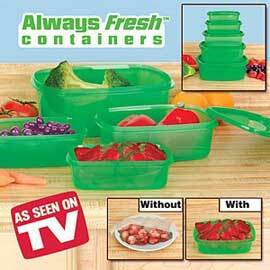 Always Fresh Containers™ also help prevent vitamin loss without the use of harmful toxins. All you have to is seed your yard and water QuickLawn does the rest Withstands heavy traffic! Resists insects and disease! Tolerates shady spots! Adapts to a wide range of soils from sandy to heavy clay!